I have thought a lot about that experience over the years. What is it about seeing others who feel like “our own” that creates that reassurance? There is a photograph downstairs in our “rec room” that stands out, people ask me about it all the time. It’s a photo of my friend Nathan Mair and his grandchild. Sadly I have forgotten the name. But I shall never forget the story of how Nathan and Tobias met and became family. Nathan had recently been in a car accident, his wife Vi had died in the crash and he went through a lengthy recovery. He gave his Georgetown PEI family all the credit for his healing. Later he felt lost and adrift. The United Church came calling, they invited Nathan, a Methodist scholar, to travel to Zambia and attend a worldwide Methodist conference on behalf of the UCC. At the time Zambia was recovering as well, many of its citizens had died of the HIV AIDS virus. Nathan met many people at the conference but he also moved outside the gathering to meet some of the locals. There he met a young man named Tobias. Tobias’ story was tragic, he had nursed his parents and siblings and all had eventually died. Tobias was now an orphan living in a nearby barn. Nathan asked Tobias as his hopes and dreams and was surprised to hear a calling to visit Canada and study nursing. Long after Nathan returned to PEI these two maintained a friendship and correspondence. Finally Nathan polled his friends, could they help him with his small pension to financially support Tobias in his studies at UPEI in nursing. We did, Tobias lived with Nathan and soon after he called his mentor Papa and the father-son relationship endures. Tobias later switched his major to social work, got married and had children, he lives in Calgary where he works with at-risk youth. Tobias has written two books on identity, healing and transformation, both of which I have in my library. Nathan is very proud of his son and he dots on his Calgarian grandchildren. My friend Mark lives in Springfield MO. He raised three children there, all orphans from India. None were related by birth. When Mark would go to the grocery store people would see him and his daughters and ask, “Are they all yours?” “Yes” he would answer. Some would then press further, “Do they all have the same mother?” “It’s worse than you think”, Mark would slyly add, “They all had different fathers too.” People would walk away, heads shaking, disgusted by whatever they imagined. Most of the weddings where I participate as presider include the vows, “Where you go, I go. Where you lodge, I lodge. Your people shall be my people, and your God, my God. May the Lord do thus and so to me, and more as well, if even death parts me from you.” These words were spoken by Ruth to her mother-in-law, Naomi, who had lost both of her sons and her husband. When her sons died, she told her daughters-in-law, Ruth and Orpah, to return to their homeland of Moab. Orpah kissed Naomi and bid her a heartfelt farewell. Ruth, however, responded by taking these vows to her mother-in-law. Vows that we use today in our Christian marriage services. Vows that make promises to remain steadfast, loyal, and faithful to a God that was not her own. These are mighty promises, and Ruth makes them to Naomi, a woman committed deeply to her own sadness. 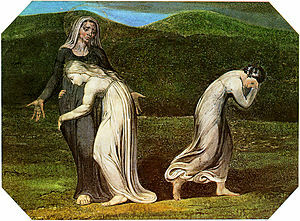 Upon arriving in Bethlehem, the whole town comes to greet them, but Naomi refuses to answer to her name, and insists that they call her Mara, which means bitter, for that is how the Lord has dealt with her. This brings us to the conclusion of Ruth and Naomi’s story. Indeed, Boaz took Ruth to be his wife and she bore a son. What happens in the text is worth noting, “Then the women said to Naomi, ‘Blessed be the Lord who has not left you this day without next-of-kin; and may his name be renowned in Israel. He shall be to you a restorer of life and a nourisher of your old age; for your daughter-in-law who loves you, who is more to you than seven sons, has borne him.’ Then Naomi took the child and laid him in her bosom, and became his nurse. The women of the neighborhood gave him a name, saying, ‘A son has been born to Naomi.’ They named him Obed; he became the father of Jesse, the father of David” (Ruth 4:13-17). What is most remarkable about this story is not just that Ruth demonstrated such an unabashed fidelity to her mother-in-law, it is that God used these women to create a new family. When the child is born, he is not praised as Boaz’s son. No, he is attributed to Naomi, who becomes his nursemaid. She and Ruth raise the child, vows solidified and God’s blessing upon them. It is not my place to surmise anything about their relationship other than what is in the text, but what the text tells me is that they have found a new way, a beautiful way, to create a family together. The best part is that this child is referred to later on, in the Gospel of Matthew, chapter 1, which is the genealogy of Jesus. This genealogy begins with Abraham and concludes with Joseph, the husband of Mary, to whom Jesus was born. The only other woman named in this genealogy is Ruth, mother of Obed (Matthew 1:5). The vows that Ruth and Naomi took to one another were about more than just establishing a next-of-kin for a woman who had lost everything. This child, Obed, is the son of women who loved each other dearly; this child, Obed, is in the lineage of our Messiah. He was King David’s grandfather, the father of Jesse about whom we sing at Christmas. Sometimes when Kim and I are out and about people will ask us “is she your only child?” Other times people will refer to a family they know and offer the assessment, “Rachel is theirs and Norah is adopted”. The words only and theirs are most interesting. In the age of Trump there is a backlash against anything that smacks of being “politically correct” and thus examining what we mean when we choose certain words is easily dismissed these days. But there is a clear assumption to our language of family that intimates who is us and who isn’t. Further, when we speak of love and what loves does we tend to privilege certain manifestations of love over others. We assume more conventional and biological relations are fused with love and other kinds of relationships secondary kinds of affection. Yet in times of funerals I have noted a shift. More and more loved ones are asking that friends sit with them as “family” and relations they know less well sit with the congregation. After all when you are in deep grief whom do you want to be present to you physically and emotionally, a long-time friend or a family member who lives a continent away whom you last saw 10 years ago at a wedding? And when I have been privileged to be with persons who are dying I have heard them say to me that some of their dearest memories are formed by relationships whom they first met at complete strangers, persons they had little connection with at first blush. If you look at the offerings at card stores, the images at the banks where you go to get your car loan, or any of the ads used to sell you things the assumption is clear, family is your kin, people who look like you, people with your experience. Yet on this All Saints Sunday know that in the Gospel of Matthew, in the genealogy of Jesus, there appears the story of Ruth and Naomi, two women from different families, different ethnicities, and different religions. Love is love. We make a big mistake when we try to draw boundaries around love and we open ourselves to God’s greatest gift when we open our imaginations to God’s definition of family. What a gift! Amen.